This entry was posted in Kyle Evans and tagged Bootles, coffee, Kyle Evans, Sofia, starbucks, Work In Progress on August 21, 2018 by Rob H Hunt. Hello there! It’s been a while since I last posted, but I wanted to let you know about a fun development. I now have a YouTube channel where I talk about my books and answer readers’ questions. You can find a link to the first video right here. More will follow! I hope you enjoy the channel! This entry was posted in YouTube and tagged book, Flicker, joel, sara, video, YouTube on May 16, 2018 by Rob H Hunt. The Charlie and Lola books are firm favorites in our household. Funny, sweet and wonderfully illustrated, they tell the story of Charlie (aged 11-ish, I think) and his little sister Lola. Every book begins with the words, “I have this little sister, Lola. She is small and very funny.” and goes on to describe a specific episode in their lives. The books are narrated by Charlie and often focus on his attempts to help his little sister. I Will Never Not Ever Eat a Tomato describes how Charlie convinces Lola to try new foods by pretending that they are not what they seem (for example, mashed potatoes are actually cloud fluff from Mount Fuji). 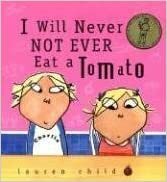 Although I love all of the Charlie and Lola books that I have read, I am singling out this one because it was the first one I read to my children, and also because I have two very picky eaters at home! Other great titles in the series include: I Am Not Sleepy and I Will Not Go To Bed, But Excuse Me That is My Book and I Am Too Absolutely Small For School. These books are perfect for 3-7 year-olds, and their parents. This entry was posted in Books I Love on September 22, 2017 by Rob H Hunt. I am delighted to announce that The Watchful Face is now available as a paperback or Kindle book at Amazon.com, Amazon.co.uk and other retailers. It is a shortish story (too long to be called a short story and too short to be called a novel) about a boy called Luke who has been watched by a silent face for his whole life. Then, one day, the face starts to speak to him. This entry was posted in The Watchful Face and tagged amazon, book, mystery, thriller on September 5, 2017 by Rob H Hunt. This entry was posted in The Watchful Face and tagged amazon, book, cover, publishing, thriller on August 17, 2017 by Rob H Hunt. O n a recent family vacation to the UK, my sister (Kate Cooper ) presented James Chapman and me with this delicious edition of Kyle Evans and the Key to the Universe. Every detail of the cover had been perfectly reproduced. James thought it looked even better than the original. I’m certain it tasted a whole lot better (although to be fair, I haven’t actually tried to eat a paper copy of the book). Yummy! This entry was posted in Kyle Evans on July 23, 2017 by Rob H Hunt. Well, to be honest, it’s not really pictures that have been distracting me recently, but picture books. Specifically, ideas for picture books, of which I have several. Unfortunately, I have less artistic talent than an Enderman, so these ideas are just a bunch of words right now. In other news, I am still gathering feedback to my new shortish story, and the third and final Kyle Evans book is coming along slowly (thanks to those pesky Picture Book ideas!). This entry was posted in Kyle Evans and tagged book, picture book, Work In Progress on May 9, 2017 by Rob H Hunt.